TV treats on Saturday night were a family tradition Growin’ Up in Maine. In the 1950’s there were 3 small convenience stores on Railroad Street in Derby, Maine, where I lived, and they serviced the entire village. McKusicks at the foot of Derby Hill specialized more in dry goods or hardware, and had trucks that delivered heating oil. Hackett’s and another store owned by Helen and Quincey Livermore were closer to the railroad tracks, and had mostly food items (and treats) or sundry goods like a general store. Go back 50 years earlier at the turn of the century, and I’m told the front room of our home on Railroad Street was an ice cream parlor. All that including the stores are gone. The post office and grammar school are gone, too. Imagine the excitement of 8 kids given their choice of individual treats of ice cream, popcorn, candy, chips, or nuts. Store bought treats weren’t always in the budget. TV treats on Saturday night might be homemade, yet they were still a treat even though the only choice was one choice. Dad made fantastic chocolate fudge with walnuts from scratch cooked in a cast iron frying pan. At other times he and Mom popped popcorn that was covered with caramel, and rolled into balls the size of a softball. 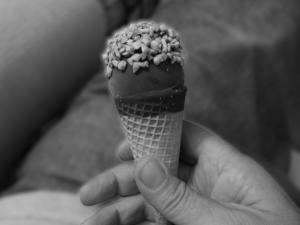 The treat shown in the photo here is a Drumstick made with a scoop of vanilla ice cream in a wafer cone dipped in chocolate and covered with crushed peanuts. Penny candy, literally for 1 cent each, is a thing of the past, but you can still get Drumsticks! That photo is a modern Drumstick, and that’s my hand holding it. You notice how small it looks? As prices for everything rise over the years, product size and packaging has become deceptively smaller and smaller. Those who grew up enjoying TV treats on Saturday night in the 1950’s have noticed. The memories are still priceless.